I'm keeping today's post quite short. Our darling Emma had surgery today, so I can't seem to focus on much else than her. She had a few molars removed because of an abscessed tooth situation. We've been told it's a fairly routine operation, thankfully. But as any fur mom will tell you, it doesn't matter if it's routine or not, you fret and worry because it's your darling pup. I've gathered some of my most recent favorite wallpapers to help distract me today. Hope you enjoy! Love, love your blog. 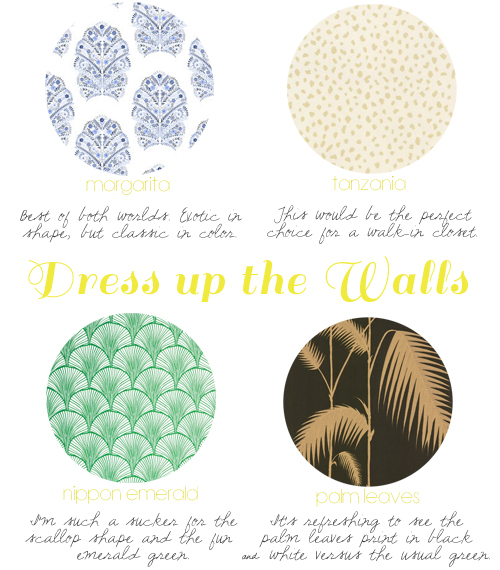 Great ideas and this wallpaper is oh so lovely! Thanks Lindsay! Love yours too! How amazing is the black & gold one?? Oh, who am I kidding. I want them all, haha.